Welcome again to my little bit of blogland! NO you are not imagining things im blogging twice in one day! Today is the start of a brand new challenge over at The Crafters Cafe challenge blog. The theme is Breast Cancer awareness. We have some amazing sponsors this month and would love for you to join us over in our challenge. Robins Fetish and I hope that you like it! So I took a 6x4 card blank and covered it with card that I inked around the edges I then layered a pale pink piece of card on that and topped it with a heart shape doily and die cut. Next I added the Fab Queen of Hearts image that has been coloured with copics and to finish I have embellished with some paper/ mulberry flowers, self adhesive gems and a pink awareness ribbon. 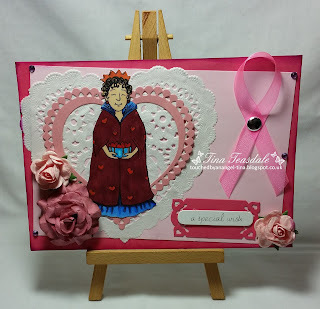 This is gorgeous Tina, love the image and beautiful embellishments.